* Mix videos with photos.. * Add more effects.. * Optimize video save speed.. * Other bug fixes and UI improvements. Best Instagram Video Editor and Photo Editor with blur background and no crop, no watermark!Add music and other effects on videos for YouTube.Merge and Trim videos with effects.Also a Professional Photo Editor, with collage, filters, text, stickers, etc. Top Video Editor and Photo Editor App on Goog... see more Best Instagram Video Editor and Photo Editor with blur background and no crop, no watermark! Add music and other effects on videos for YouTube. Merge and Trim videos with effects. Also a Professional Photo Editor, with collage, filters, text, stickers, etc. 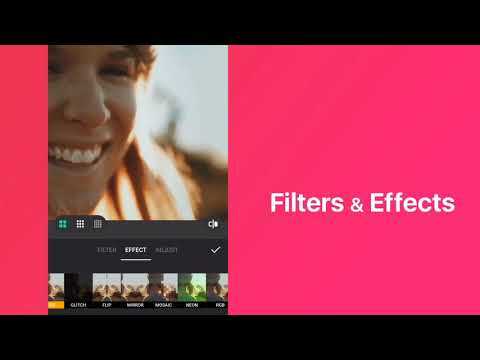 InShot - Featured by Google Play, Best Instagram video editor pro and photo editor with adding music, effects and text on video, blur border on video, best for YouTube videos , vine videos, dubsmash videos, lip sync videos and Don’t Judge Challenge videos! 1. Support most video formats, like MP4, MOV, AVI, FLV, 3GP etc. 2. Merge multiple videos with effects. 3. Video trim, video cut, video compress and video convert. 4. Video editor with text, emoji, stickers and no watermark. Merge multiple videos with all kinds of effects, best video merger. Easily convert videos to MP4 format, free video converter. 1. Compress video size with custom output resolution. 2. HD video output resolution supported. 1. Unique filters & colorful backgrounds, adjust lightness, contrast, warmth, saturation etc. 3. Multiple ratios supported, like 4:5, 2:3, 9:16, 3:4, 1:1. 1. Add InShot featured music or music downloaded on your phone for videos. 1. Add subtitles for your videos, many fonts supported. 2. Add unique text to create your own watermark. 3. Trending stickers and emoji for photos and videos. 4. Photo editor and video editor pro. 2. Choose different filters for each grid. 3. Crop each photo as you like. 2. Share your works to social media with no crop. 1. Custom video output resolution. All in one video converter. 2. Share to social apps with this best video editing app.